For well over a century, we’ve valued our brokers and our policyholders, our neighbours and our friends. We’ve watched them build homes and businesses, and relationships with one another, to form communities that are special. We appreciate that, because we live in those communities too. And we truly believe that as people who share the same schools, the same rinks, parks, markets and love of fresh air as you, that we’ve all made a commitment – to keep the communities we love going strong. That’s why we here at The Commonwell donate our time and funds to registered charities with causes that really speak to us, and to the people we work with and serve. We appreciate the scraped knees and street hockey games of the kids next door, so we look for opportunities to support youth education and well-being. We enjoy a good backyard barbeque or a friendly chat over coffee, so we support campaigns to keep our friends safe. Wherever we feel that a difference can be made to the future of our children, the health of our neighbours and the general safety of those we care about, we give as generously as we can. We call this our ‘C.A.R.E. – Create a Ripple Effect’ program. The program was started by one of our legacy companies, Farmers’ Mutual Insurance Company (Lindsay), with success stories that we’re pretty proud of. To make sure that our corporate financial support is shared fairly and effectively, we have a process in place that has worked for a number of years. Serve within our trading territory. Organizations and events that meet our C.A.R.E. – Create a Ripple Effect program focus and eligibility criteria detailed above are invited to complete and submit an application. Please complete and submit the C.A.R.E. – Create a Ripple Effect Request Application Form if you would like to request support. All applicants will receive a timely response following a review of their application by our C.A.R.E. – Create a Ripple Effect committee. The Commonwell Mutual`s C.A.R.E. 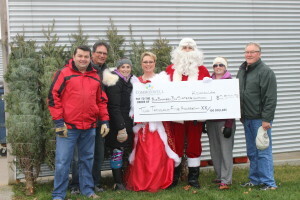 (Create a Ripple Effect) Committee, in the spirt of the season, donated $5,000.00 to the Kawartha Lakes Food Source, bringing this year`s donation total to $10,000.00. 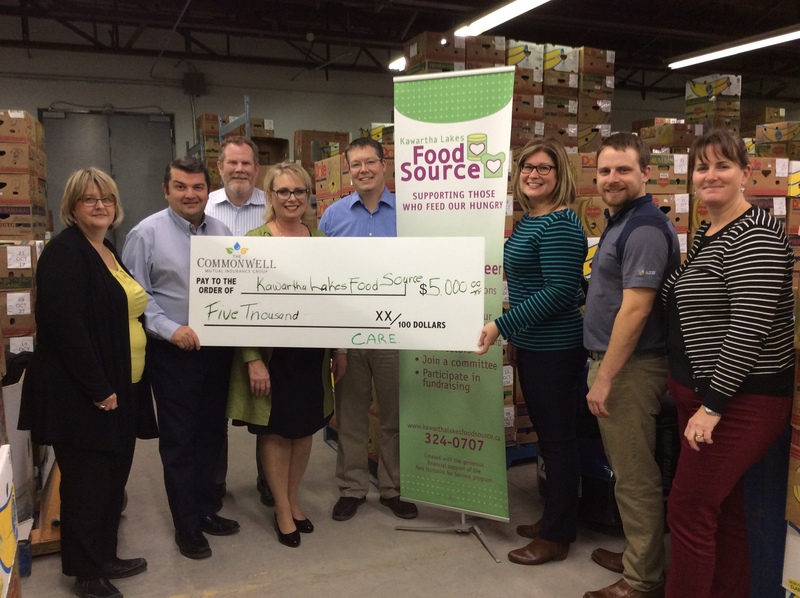 Kawartha Lakes Food Source (KLFS) is the only non-profit food distribution warehouse in the City of Kawartha Lakes and one of only five in Ontario. Our mission is to reduce hunger in our communities by continually improving the quality of services and programs that they offer to those who struggle with food security. Pictured from left to right: Courtney Smeall, Linda Taylor,(CMIG) Michelle Alder, (KLFS) Michael Leach and Regena Scott (CMIG). The Commonwell Mutual Insurance Group – C.A.R.E. 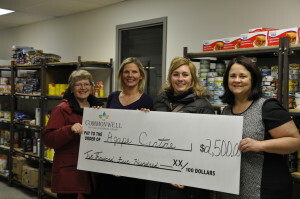 (Create a Ripple Effect) Committee is pleased to support the Kawartha Lakes Food Source with a C.A.R.E. donation of $5,000.00, in support of the School Milk Program. KLFS set up a weekly Milk Program several years ago in order to provide a regular milk supply to both their member agencies (food banks) and the Grab ‘N Grow Breakfast Program. This donation would specifically go towards the Grab ‘N Grow school breakfast and snack programs at 20 local elementary and secondary schools. Kawartha Lakes Food Source (KLFS) is the only non-profit food distribution warehouse in the City of Kawartha Lakes and one of only five in Ontario. Their mission is to reduce hunger in our communities by continually improving the quality of services and programs that are offered to those who struggle with food security. Rebecca Goddard, Fundraising Researcher, (KLFS) . Scott Crone, Phil Nichols, Regena Scott, Michael Leach and Jennifer Hope from The Commonwell. Heather Kirby, (KLFS). The Commonwell Mutual Insurance Group – C.A.R.E. 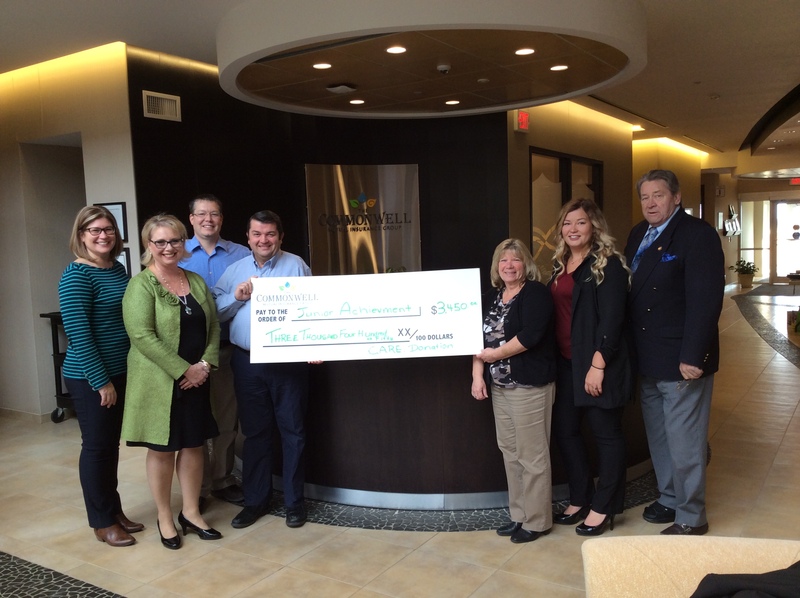 (Create a Ripple Effect) Committee is pleased to support Junior Achievement of Peterborough, Lakeland, Muskoka , with a C.A.R.E. donation of $3,450.00, in support of programs in local schools. The Children’s Treatment Centre provides therapeutic counselling services to children who have experienced trauma from sexual and/or physical abuse and their families. The Centre does not receive any government funding and the services it provided are maintained through donations received and funds generated from fundraising events. Since the Centre started in June 1996, it has served a total of 2,446 children from 2,106 families. C.A.R.E funds will provide free transportation to children to attend counselling sessions. The majority of children who receive services from the Centre are from low income families. Pictured in the photo: Children’s Treatment Centre volunteer drivers, Hugh Primeau, Mary Lalonde and CLaude Doth; Lynne Hurtubise, The Commonwell Mutual Insurance Group; Don Fairweather, President of the Children’s Treatment Centre Board of Directors and Lyle Van Allen, volunteer drive. 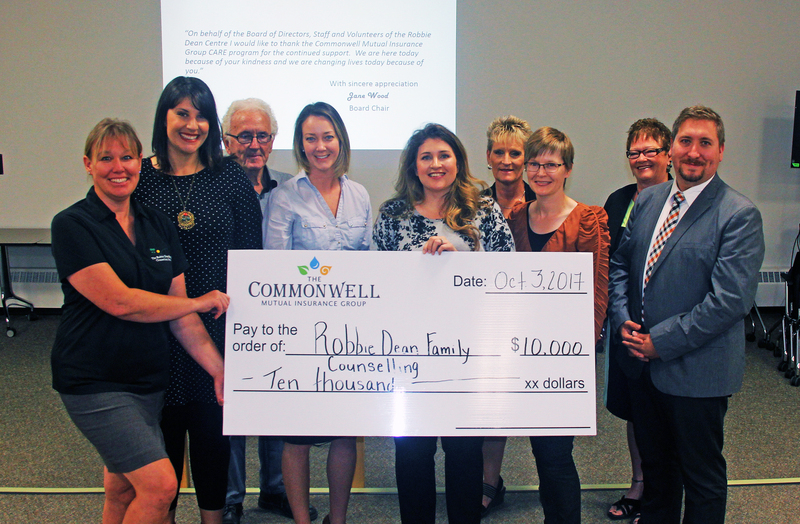 The Robbie Dean Family Counselling Centre (RDFCC) is a charity that provides free mental health services to all residents of Renfrew County. The center was created in 2013 to provide services to all residents of Renfrew County. The centre was created in 2013 to provide services that bridge service gaps in the current mental health support system. The majority of their clients are between the ages of 17 to 30 and fall in this difficult transition stage between youth and adulthood. Today the centre has offices in Pembroke, Eganville, Renfrew and Petawawa. The walk-in clinics are open 16 hours per week in each location. An average of 180 individuals visit the clinics each month. C.A.R.E funds will provide additional counselling services. Vanessa Swan, CMIG, center, presents a cheque in the amount of $10,00 to the Robbie Dean staff. Girls Inc. inspires all girls to be strong, smart and bold through direct service and advocacy. With their comprehensive approach to whole girl development it equips girls to navigate gender, economic and social barriers and grow up healthy, educated and independent. They also advocate for legislation and policies to increase opportunities for all girls. YMCA is committed to nurturing the potential of children, youth and families, promoting healthy living and fostering social responsibility within the community. Their Core Values of caring, honesty, respect, responsibility within the community. C.A.R.E funds will assist with the Economic Literacy program funding. From left to right: Jesse McMahon – Girls Inc., Joanne Systma – Girls Inc., Lesley Hubbard – Girl Inc., Theresa Messier – The Commonwell, King Yee Jr. – Waterway Insurance, Vanessa Swan – The Commownell, Mary Rae Knapp – J.B Kelly, Stephanie Coutlee – J.B Kelly, Kim Fenn – Girls Inc., Cherylanne Burke – The Commonwell. YMCA is committed to nurturing the potential of children, youth and families, promoting healthy living and fostering social responsibility within the community. Their Core Values of caring, honesty, respect, responsibility within the community. The YMCA Strong KIds program removes barriers to participation for families who lack financial resources by providing the opportunity for their children to have life changing experiences in a place where they feel they belong, where they can learn new skills, make new friends, build confidence, feel safe, where everyone is welcome and treated fairly. They truly believe every child should have the opportunity to reach their full potential. Financial assistance provided through The YMCA Strong Kids program makes these opportunities possible. C.A.R.E funds will be used directly to enable the Strong Kids Campaign. 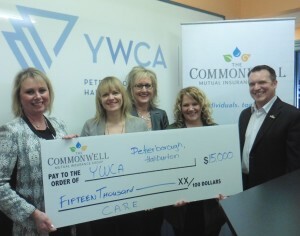 Vanessa Swan, CMIG, left presents a cheque in the amount of $5,000 to YMCA Staff members. The Perth & District Union Public Library serves the Town of Perth, the Township of Drummond/North Elmsley, and Tay Alley Township. In 2016, the library had more than 125,000 people through its doors, who checked out almost 135,000 items and attended more than 650 programs. The library’s Summer Literacy program offers one-on-one tutoring to more than 100 area children each summer who are in need of extra help to develop their reading skills. Each participant in the Summer Literacy Program receives 9 to 10 hours of tutoring with a trained university or college student, in a program known to improve attitudes and confidence about reading that will help these children succeed in school and life. The Summer Literacy Program has helped 1,600 children over the past 27 years. C.A.R.E funds will allow the Summer Literacy Program to carry on and enable them to supply books for children! 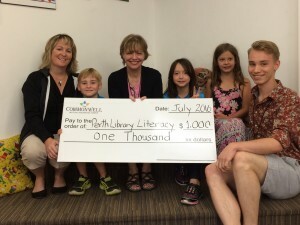 Angie White (CMIG), second from left, presents a cheque in the amount of $3,000 to members of the Perth and District Union Public Library. Through the C.A.R.E program, the sum of $20,000 was donated to assist Five Counties. Five Counties Chrildren’s Center is dedicated to supporting children and youth with physical, developmental and communication needs, In partnership with families and communities, they strive to enrich their independence and quality of life. 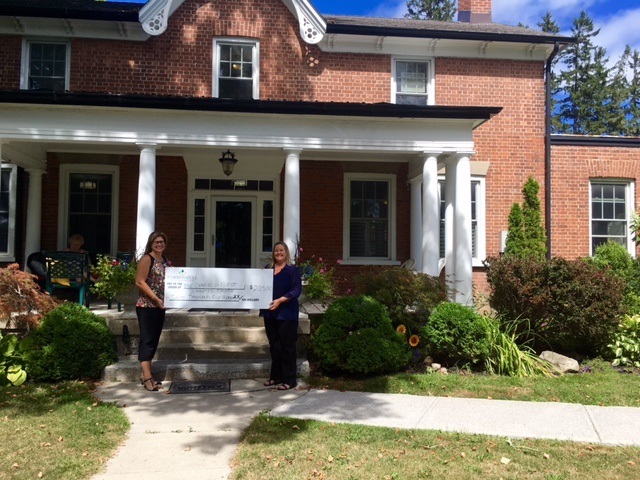 This recent donation will assist with providing therapy to children within our community. Commonwell Team members were excited to present Hub Hospice Palliative Care with a $10,000 cheque. These funds will be used to support education and training of regional providers. 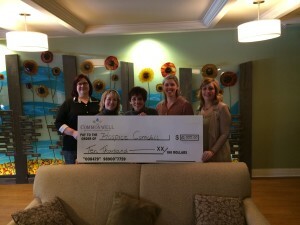 Left to Right: Toni Surko and Jane Henderson, Hub Hospice, Judy King, Angie White and Katlyn Ryan, The Commonwell Mutual. The Campbellford Memorial Hospital was honoured to receive a donation of $20,000 from the Commonwell Mutual Insurance Group’s C.A.R.E (Create a Ripple Effect) Program. These funds will assist with the purchase of a new Portable X-Ray Machine for the hospital. Every year, thousands of people from the Campbellford and surrounding area come to CMH seeking expert care and/or treatment to help restore their health, including surgical services, restorative care to palliative care, diagnostics to acute care and outpatient care. 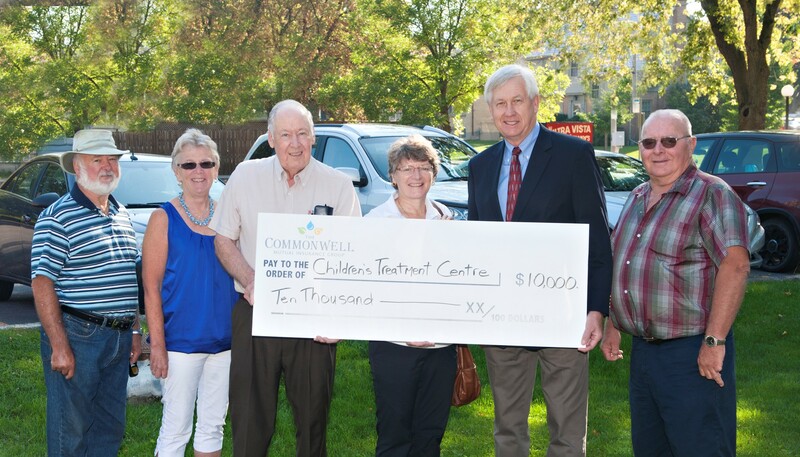 The CMH Foundation is very grateful for Commonwell’s support. Pictured (left to right) are Brad Hilker, CMH CEO, Paul Spry, Lisa McGill, & Mike Leach, Representing Commonwell Mutual Insurance, Calvin Newman, President, Newman Oliver & McCarten Insurance & CMH Foundation Chair, and Fay Smith, CMH Diagnostic Imaging Manager. Helping Hands received a generous donation of $5,000 from The Commonwell Mutual Insurance Group, C.A.R.E. Committee. This donation will be used to support social programs for seniors and adults with disabilities, designed to reduce isolation and promote community interaction. Helping Hands is based in Orillia and provides a wide range of Community Support Services in the City of Orillia and Townships of Ramara, Oro-Medonte and Severn. Jennifer Hope, Paul Spry, Michael Leach, The Commonwell Mutual, Rob Soczka, Executive Director, Vickie Scott, Coordinator of Client Care and Regena Scott, The Commonwell Mutual. The funds provided will be put towards the purchase of 30 new pedal bikes that will be used by our Adult Day Program members in Aurora, Richmond Hill, and Bradford. The addition of these pedal machines will help seniors continue to live well, age well, and be well. CHATS is a not-for-profit charitable organization that provides programs and services to enhance the health, wellness and independence of more than 7,700 seniors and caregivers each year. CHATS head office is located in Aurora, Ontario. The Commonwell Mutual Insurance Group recently made a $20,500 donation to help fund the Pediatric Emergency School Program. This funding will ensure that all of the children whose families are struggling financially could have an emergency kit in the office and the classroom, and supplies and medications refilled as they are used throughout the year. Founded in 1989 as a “first of its kind” centre in Canada, the Charles H. Best Diabetes Centre serves over 500 children and 1500 adults with Type 1 Diabetes in the Durham region and surrounding area by providing the most current and top level education, support and management available from the time of diagnosis through all of life’s challenges; from sick days to pregnancies, from school days to work days and every day in between. Their inter‐disciplinary team includes, registered nurse educators, dietitians, physicians and social workers all working together to improve the quality of life for individuals living with type 1 diabetes. Photo:Right: Jennifer Hope, CMIG presented the funds to the Charles H. Best Diabetes Centre Team. The Commonwell Mutual Insurance Group recently made a $5,000 donation through their C.A.R.E. 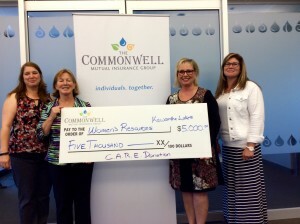 campaign to Women’s Resources of Kawartha Lakes. 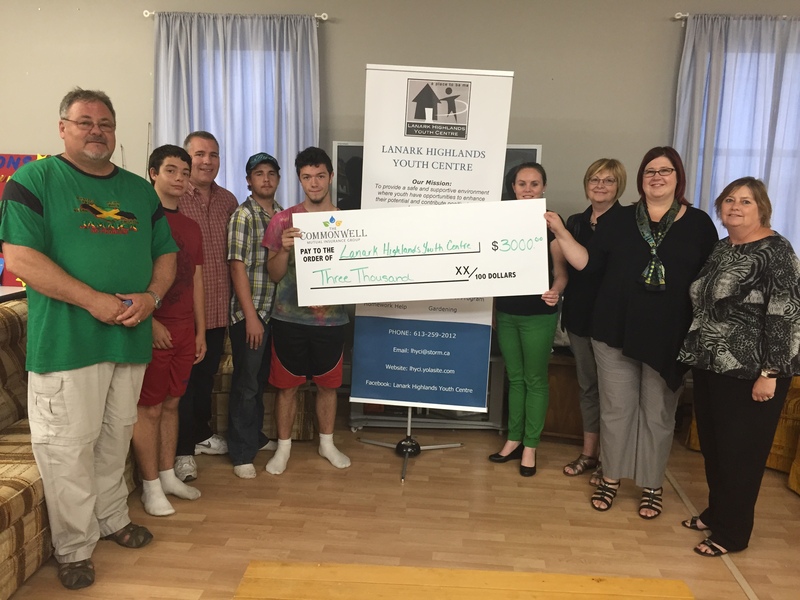 The donation will support their Amy’s Next Step Housing Renewal Campaign. Women’s Resources of Kawartha Lakes is a not-for-profit charitably organization created and run by local women. For 27 years, Women’s Resources has been providing programs throughout Kawartha Lakes to ensure that abused women and children get the help they need to lead lives free of abuse and violence. The Commonwell’s C.A.R.E. donation will assist with necessary interior upgrades to Amy’s Next Step Housing Renewal Project, an eight-unit apartment complex that provides safe short-term housing for women who are seeking to rebuild their lives after leaving an abusive situation. 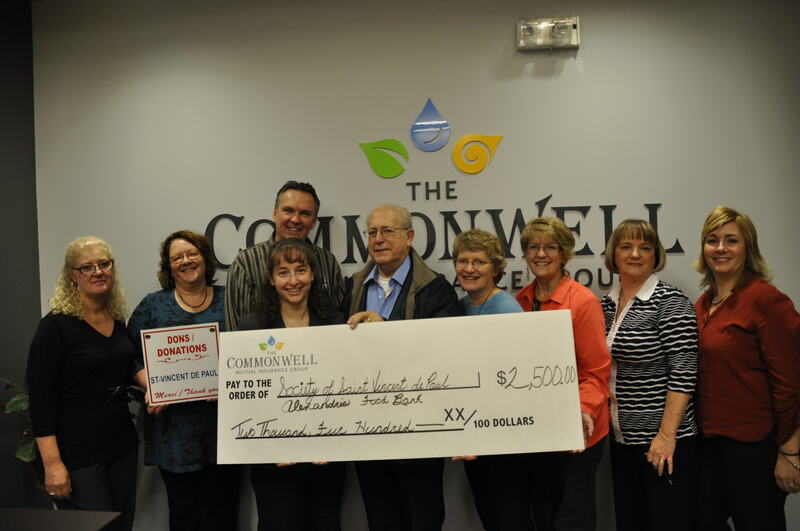 The Commonwell Mutual Insurance Group recently made a $26,473.96 donation through their C.A.R.E. 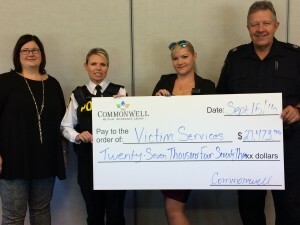 campaign to the Victim Services, in Smiths Fall, Ontario. Victim Services is a non-profit, 24/7 community agency that provides immediate, confidential short-term crisis intervention services, practical assistance, information, referrals and emotional support to persons affected by crime, tragedy and / or disaster. The donation will be allocated across 7 Victim Services sites to purchase and maintain 52 GPS trackers. 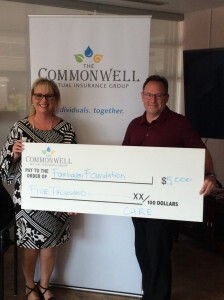 The Commonwell Mutual Insurance Group recently made a $5,000 donation through their C.A.R.E. campaign to the Fairhaven Foundation, in Peterborough, Ontario. Fairhaven is one of the leading edge Long Term Care facilities in Ontario. The funds will be used to enhance the lives of the residents at Fairhaven. Photo: Regena Scott, CMIG, Keith Riel, Chair, Community Board Member. 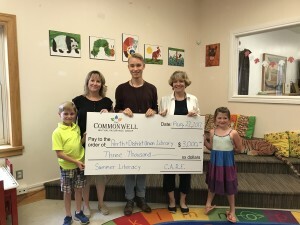 Angie White from the Commonwell Mutual Insurance Group presented a $1,000 cheque to Rachel, Librarian at the Perth Library. 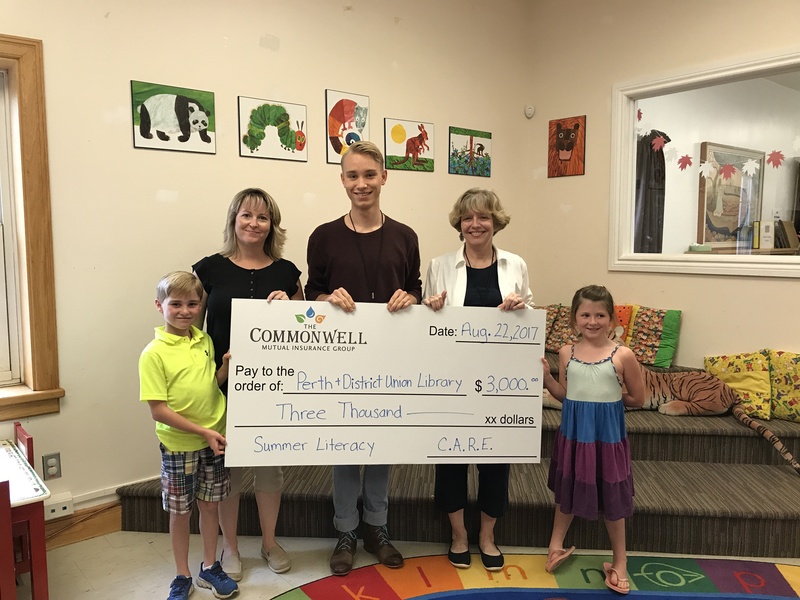 These funds will be used to purchase books for participants attending the Summer Literacy Program. 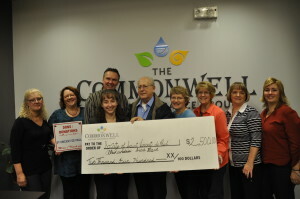 The Commonwell Mutual Insurance Group through their C.A.R.E. 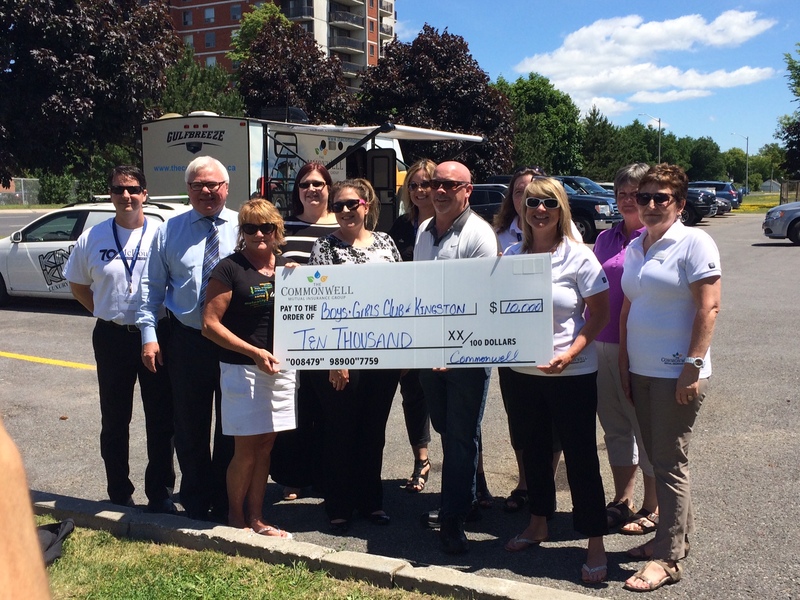 program was happy to assist the Boys & Girls Club of Kingston with a donation of $10,000. The club provides a safe, supportive place where children and youth can experience new opportunities, overcome barriers, build positive relationships and develop confidence and skills for life. 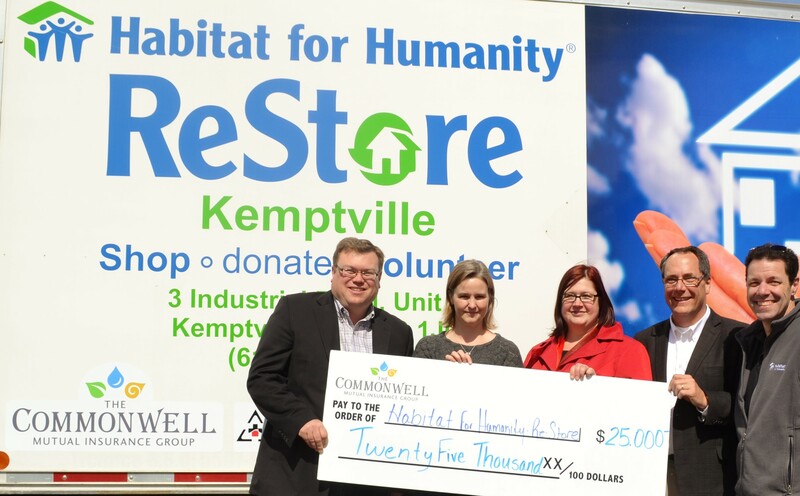 This donation was part of another donation done with one of The Commonwell’s broker partners, McDougall Insurance in celebrating their 70th Anniversary who had a goal to raise $70,000 for local charities. 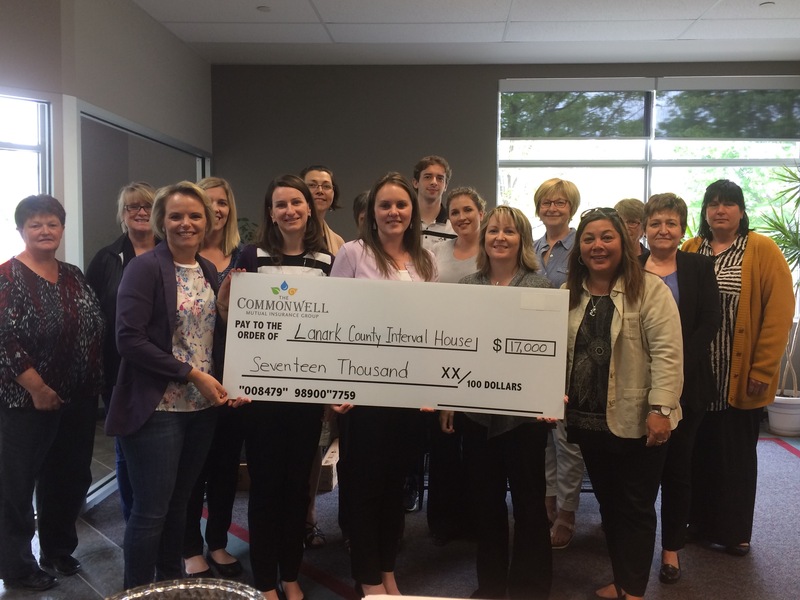 The Commonwell Mutual Insurance Group is proud to present Lanark County Interval House with a donation of $17,000 to assist in two areas – $11,000 for public education workshops dedicated to ending violence and support women and children to manage and flee violent relationships. The balance of $6,000 will be put to good use in supporting the annual Youth Conference which provides an opportunity and venue for students to explore their understanding of violence in relationships and explore the concepts related to healthy equal relationships. The Commonwell Mutual Insurance Group, was instrumental in providing the Perth and Smiths Falls District Hospital, Smiths Falls campus with an Automated Pill Dispensing machine through a grant. The new machine is expected to improve patient safety, save on medications and free up nurses to spend more time with patients and less time dispensing pills. 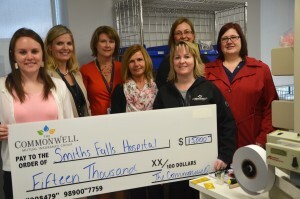 Shown here with a cheque for $15,000 from left front row: Kayla Harry, CMIG Lise Smiths, Executive Director, Smiths Falls Hospital Foundation, Angie White, CMIG; Back from left: Nancy Shaw, Vice President Clinical Services and Jacqueline Roberts, Pharmacy Manager, Tracey Curran and Mike Paczek, CMIG. The Commonwell Mutual Insurance Group, announced their latest community donation of $25,000 to the Carleton Place & District Memorial Hospital Foundation. 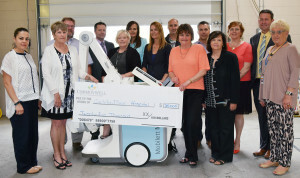 Funded through The Commonwell’s C.A.R.E (Create a Ripple Effect) program, the donation will be used to fund a new digital x-ray machine. The C.A.R.E. 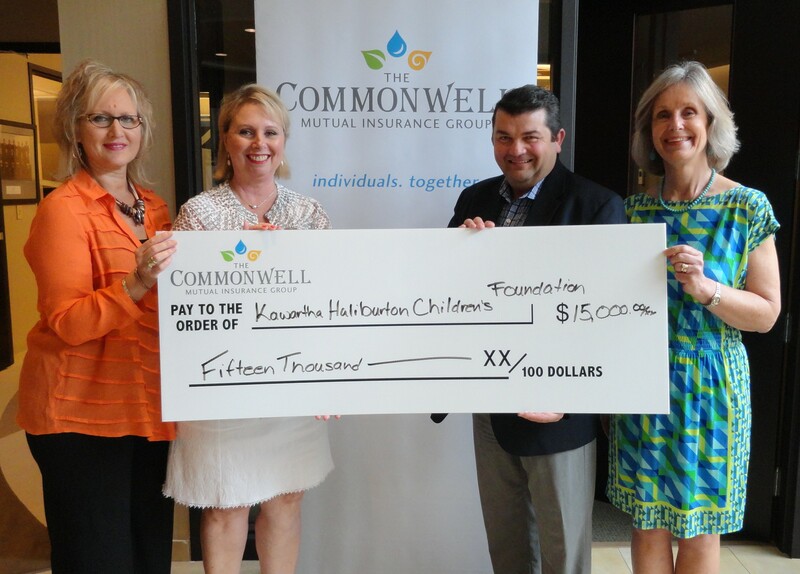 Committee approved a donation of $15,000 to the Kawartha Haliburton Children’s Foundation. These funds will ensure that 26 kids go to a week of day camp, 10 children go to a week of overnight camp and 5 special needs children go to camp this summer. Left to Right: Jenny Hill, Regena Scott, Scott Crone from The Commonwell and Margaret Cunningham from the KHCF. C.A.R.E. 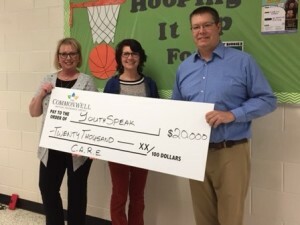 members Regena Scott (left) and Michael Leach (right) had an opportunity to attend a Youthspeak workshop at IE Weldon Secondary School, in Lindsay, and present Una Wright, Founder and Team Coach, from Youthspeak, (centre) with a cheque in the amount of $20,000. Youthspeak empowers youth who face challenges through leadership training, in order to increase their social and emotional strengths and positively impact their world by sharing their personal stories in assemblies and workshops. 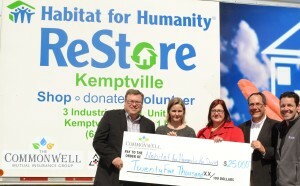 Habitate for Humanity, Kemptville received a cheque in the sum of $25,000 from The Commonwell Mutual Insurance Group. The Alzheimer Society, Peterborough, Kawartha Lakes, Northumberland and Haliburton received a cheque in the sum of $25,000 from The Commonwell Mutual Insurance Group. 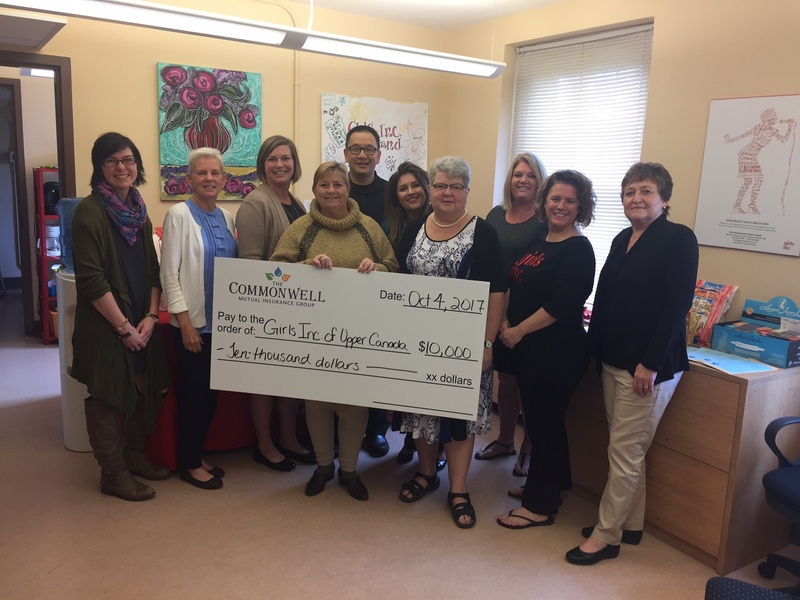 We are so pleased to receive this donation from The Commonwell Mutual Insurance on behalf of the estimated 7,500 people living with dementia and their families in our four counties! Corporate partners can make a significant difference by assisting us to enhance our education and support programs. We are so appreciative of the corporate leadership the Commonwell gives in our communities. As other companies follow their lead, we will be better prepared to meet the increasing demand for our services. The YWCA, Peterborough, Haliburton received a cheque in the amount of $15,000 from The Commonwell Mutual Insurance Group. These funds will be used to help serve the increasing number of women and children in need of safety and refuge from violence and abuse. The C.A.R.E. 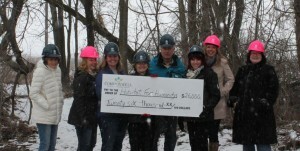 Committee recently approved a donation of $26,000 to Habitat for Humanity, Seaway Valley toward the new build taking place in Alexandria, Ontario. 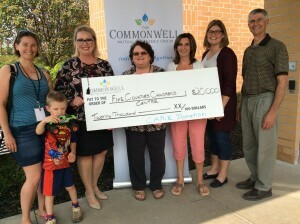 The Campbellford Memorial Hospital received a C.A.R.E. donation in the amount of $10,000.00 from The Commonwell Mutual Insurance Group. 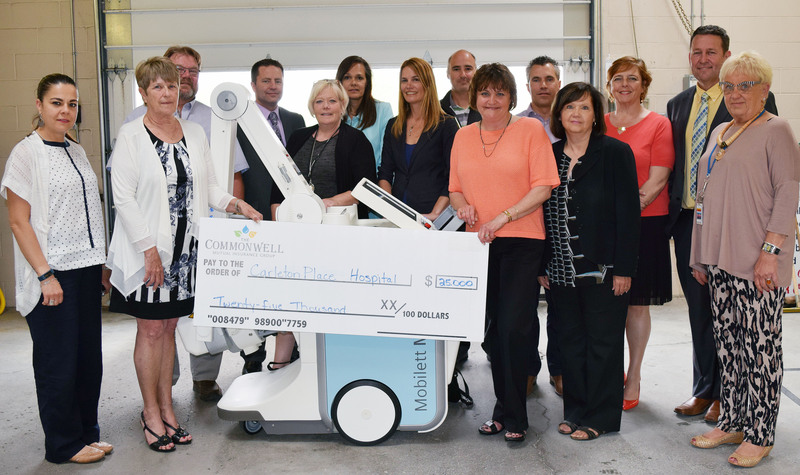 These funds assisted with the purchase of high priority equipment for the CMH Laboratory. Every year, thousands of people from the Campbellford and surrounding area come to CMH seeking expert care and/or treatment to help restore their health, including surgical services, restorative care to palliative care, diagnostics to acute care and outpatient care. 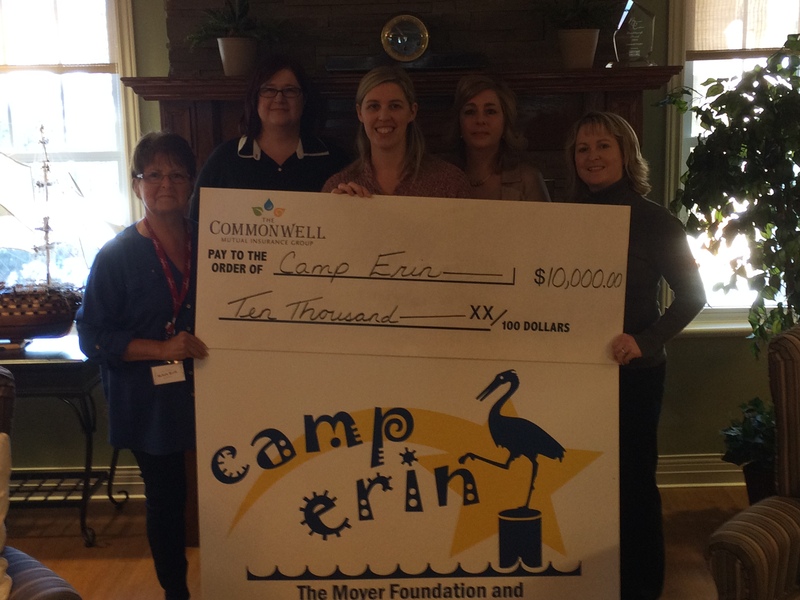 Team members from The Commonwell Mutual Insurance Group present a cheque in the amount of $10,000 to Carefor Community Services in support of Camp Erin. Carefor offers a basket of services in SDG Prescott and Russell. 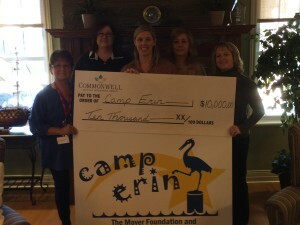 Camp Erin is a free 3 day bereavement camp for children and youth aged 6 to 17. 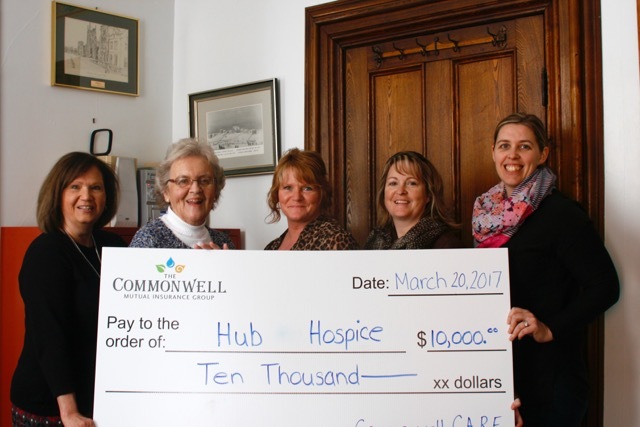 Team members from The Commonwell Mutual Insurance Group present a cheque in the amount of $10,000 to Carefor Hospice Cornwall a 10 bed residential hospice providing end of life care to the residents of Stormont, Dundas, Glengarrry and Prescott Russell. 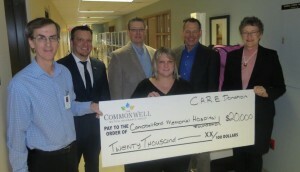 The Commonwell had the privilege to present a donation from our C.A.R.E. 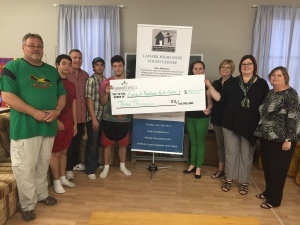 Program to The Robbie Dean Family Counselling Centre in Pembroke along with a few of our local brokers and agents, EGM Insurance, Johnston & Mackie Insurance and Peever Insurance. The C.A.R.E. Program donated $15,000 to this great organization that is committed to enhancing mental health services in Renfrew County to ensure everyone who needs help has access to resources and information. 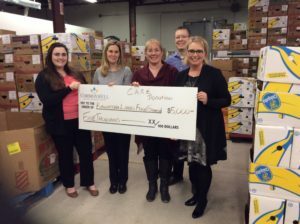 Team Members in Alexandria presented Agape Center in Cornwall, with a $2,500 to assist with food donations over the holiday season. Team Members in Alexandria presented Society of Saint Vincent de Paul, Alexandria Food Bank with a $2,500 to assist with food donations over the holiday season. 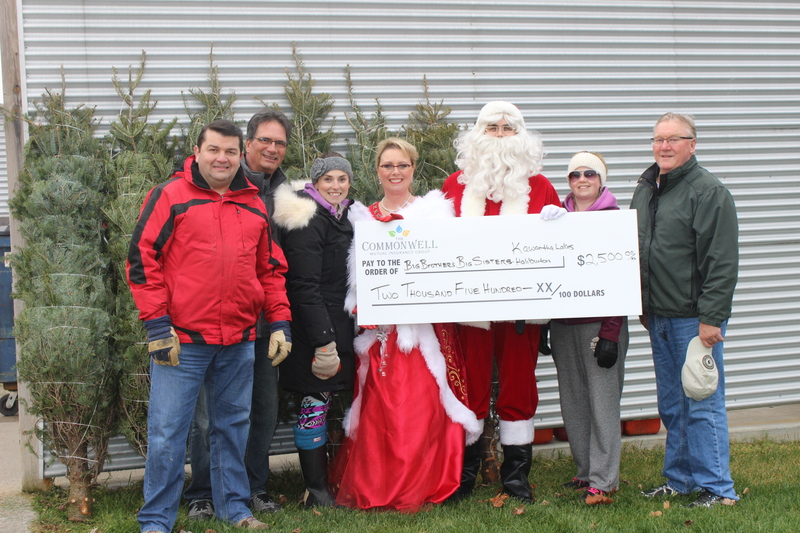 Scott Crone, Jim DeFlorio, Kim Hall – Big Brothers Big Sisters, Regena Scott, Jeff Blodgett, Lisa Hall, Terry Malcolm, Board Chair, The Commonwell Mutual, provide a cheque in the amount of $2,500.00 to Big Brothers Big Sisters at the 2nd Annual Christmas Tree Giveaway Event. The C.A.R.E. Committee recently approved a donation of $10,000 to Crowns of Life. Team members from Perth were on hand for the presentation. The donation will assist with the placement of the Susan Shirley Program. Crowns of Life is dedicated to supporting young at risk new mothers or mothers-to-be through their pregnancy and in the first few months after their baby is born. A C.A.R.E. donation of $10,000 was presented to the Madawaska Valley Hospice. The Madawaska Valley Hospice delivers quality hospice palliative care across the full continuum of care from point of terminal diagnosis through to death and followed by bereavement support to families. The donation will assist in continuing to deliver these valuable services. Perth team members Miki Paczek, Regional Manager, Bill Armstrong and Donna Myke visited the Madawaska Valley Hospice for the presentation. A C.A.R.E. donation of $50,000 was made to the Hawkesbury & District General Hospital. The Hawkesbury General Hospital serves the communities of Prescott & Russell and Glengarry. The hospital is currently undergoing a redevelopment project that will double its size. The funds will assist with the acquisition of a new MRI and CT-scan machines to enhance the services offered to the community by the Hawkesbury & District General Hospital. Tim Shauf, President and CEO and Miki Paczek, Regional Manager Perth presented the funds. Members of the C.A.R.E. 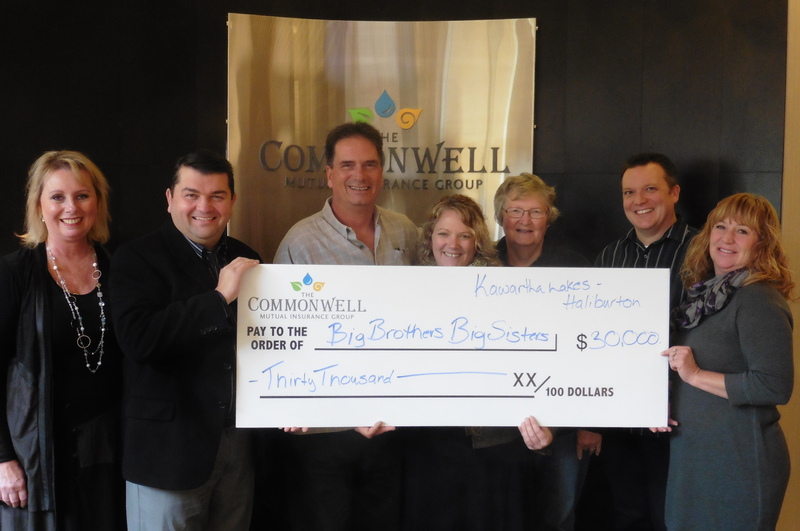 (Create a Ripple Effect) Committee presented Big Brothers Big Sisters Kawartha Lakes-Haliburton with a cheque in the amount of $30,000 from The Commonwell Mutual Insurance Group. BBBS was named as a the 2015 We C.A.R.E. 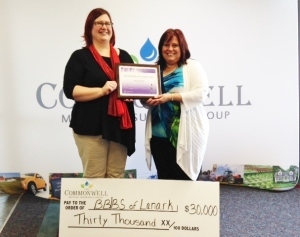 recipient, along with BBBS Lanark/Smiths Falls and Cornwall, who also received $30,000 each. Left to right: Regena Scott, Scott Crone, VP of Business Development, Jim DeFlorio, Executive Director, BBBS KLH, Terri Richard, Mary Auld, BBBS Mentor, Paul Spry and Alicia Hughes. 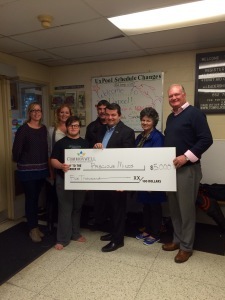 Scott Crone, VP of Business Development presents a cheque in the sum of $5,000 to Precious Minds. The funds will assist with children’s programs. 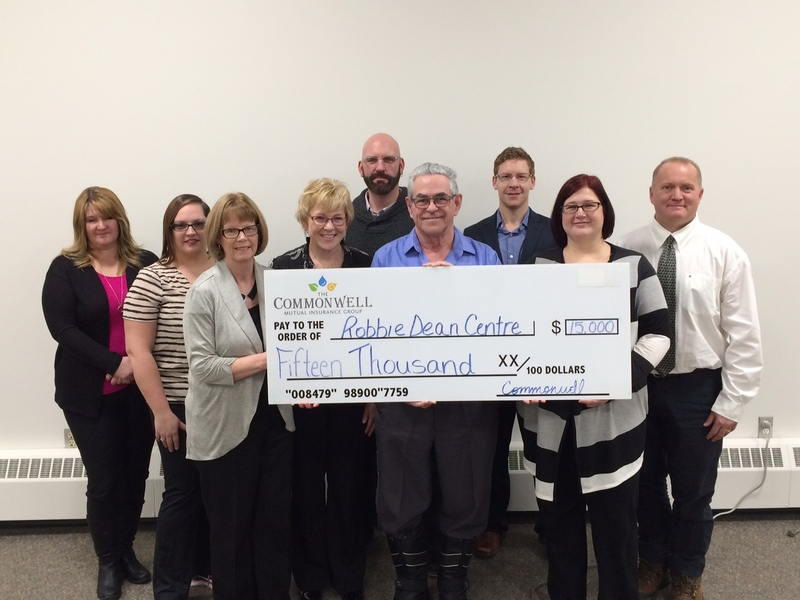 The Renfrew Victoria Hospital was thrilled to receive a $50,000 C.A.R.E. donation. 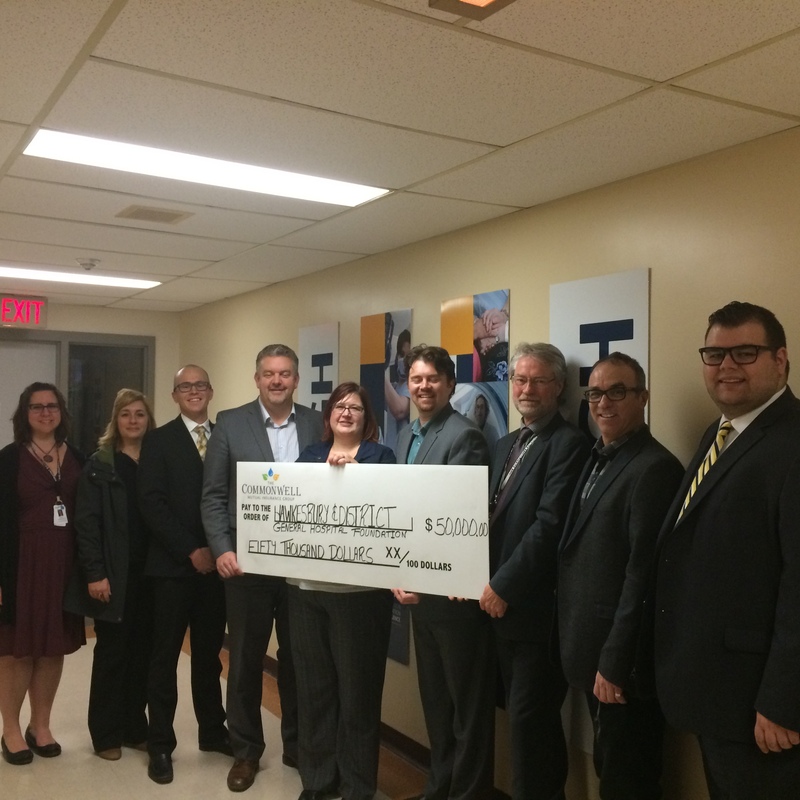 Scott Crone, VP of Regional Development presents a cheque to the hospital. 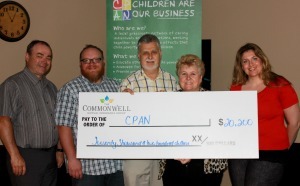 The Renfrew County Child Poverty Action Network (CPAN) received a big boost to their efforts to break the cycle of poverty after accepting a donation of $20,200 from The Commonwell Mutual Insurance Group, which the organization will use to help equip 269 children with school supplies. 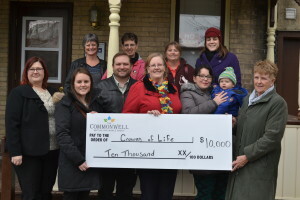 Left to right is Earl Bennett, McDougall Insurance of Arnprior, Dwane Parsons, Greg Lubimiv, Lyn Smith, CPAN co-ordinator and Vanessa Swan, Business Development Representative from The Commonwell Mutual Insurance Group. 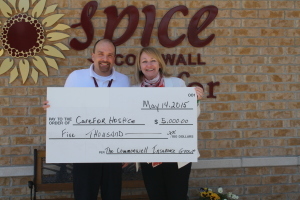 Carmel Greene, Regional Manager from our Alexandria Office presents a cheque in the amount of $5,000 to the Carefor Hospice Cornwall. Miki Paczek, Regional Manager presented Amanda Brisson, Executive Director, Big Brothers Big Sisters Lanark County, with a cheque in the amount of $30,000. 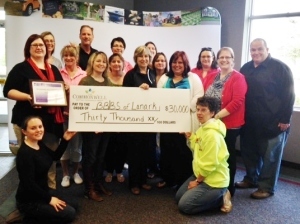 BBBS Lanark County were named as the 2015 We C.A.R.E. 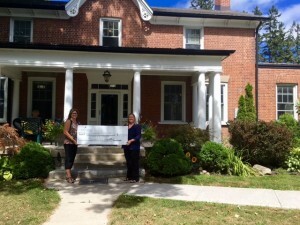 recipient, along with BBBS Cornwall and BBBS Kawartha Haliburton. 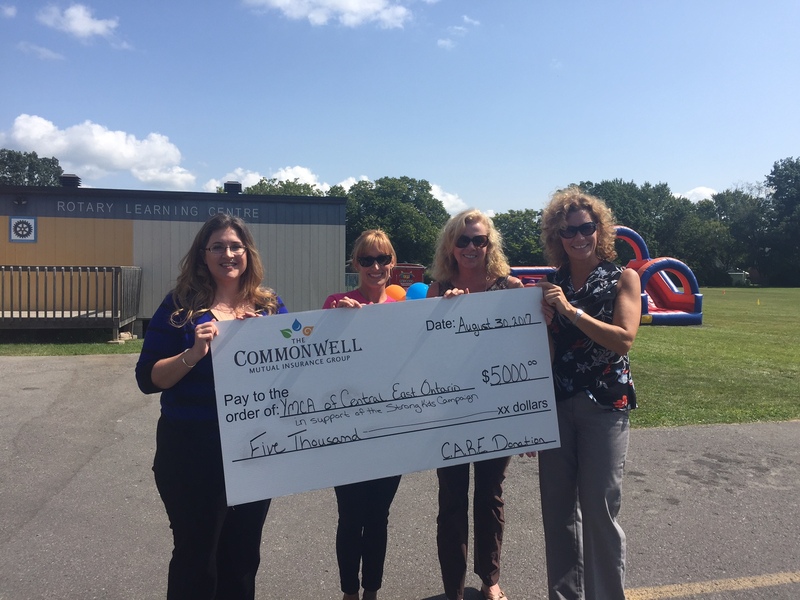 Commonwell Team Members joined in the presentation to Amanda Brisson, Executive Director, Big Brothers Big Sisters Lanark County. 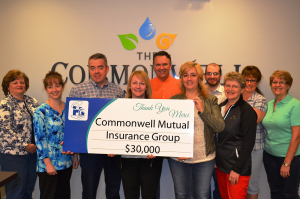 The Commonwell Mutual Insurance Group, through their C.A.R.E. 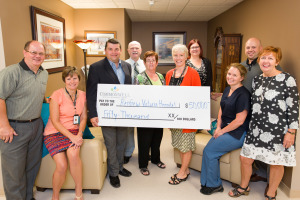 – Create A Ripple Effect program donated a remarkable $30,000 for Cornwall Community Hospital’s chemotherapy area. Carmel Greene, Regional Manager and team members presented the cheque to Todd Rozon, CCH Foundation Board Member. 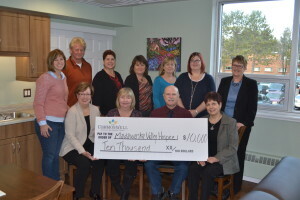 Left to right: Lorelei MacDonell, Natalie Menard, Todd Rozon, Carmel Greene, Scott DaPrato, Rachelle Joanette, Jean Sequin, Lynn Hurtubise, Debbie Sauve and Denise Millar. Commonwell Team Members from our Alexandria Office present a cheque in the sum of $30,000 to Big Brothers Big Sisters, Cornwall Chapter. 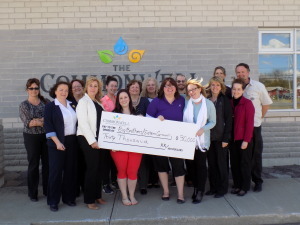 Big Brothers Big Sisters organizations from Cornwall, Lanark County and Kawartha Lakes Haliburton each received $30,000 as our 2015 We C.A.R.E. recipients. 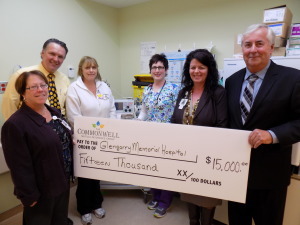 Dwight Proudfoot, Director and Scott DaPrato of The Commonwell Mutual Insurance Group, present a cheque in the amount $15,000 to CEO Linda Morrow and CNO Shelley Coleman of the Glengarry Memorial Hospital. 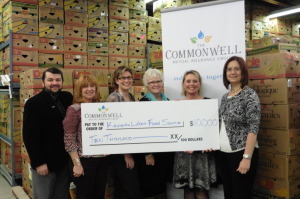 Kawartha Lakes Food Source, represented by Chair/President, Catherine Danbrook (far right) receives a cheque from The Commonwell’s team of Scott Crone, Alicia Hughes, Jennifer Hope, Ann Lean and Gena Scott. 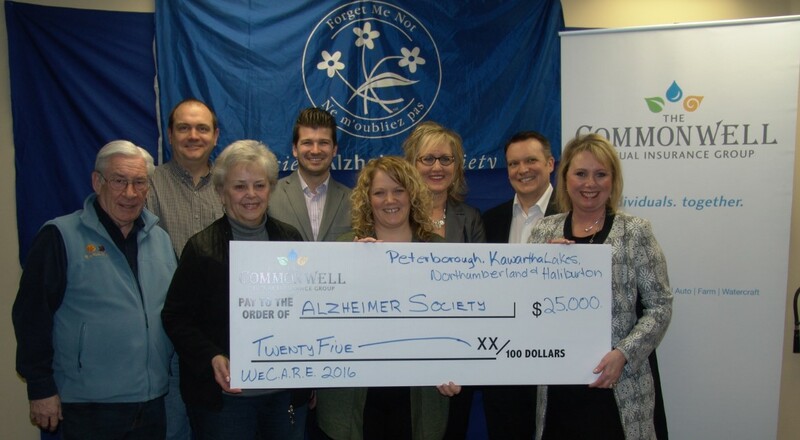 The Commonwell presented a cheque in January 2015 to Alzheimer Society. 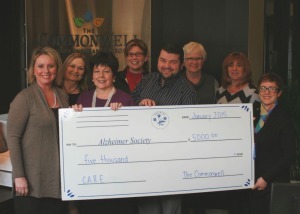 Pictured above from left to right are: The Commonwell’s Gena Scott and Diane Reimenschneider; Alzheimer Society’s Board Member, Joan McCormick; Jennifer Hope, Scott Crone, Anne Lean and Alicia Hughes also of The Commonwell team, and Lorraine McCallum, Alzheimer Society’s Fund Development Coordinator. 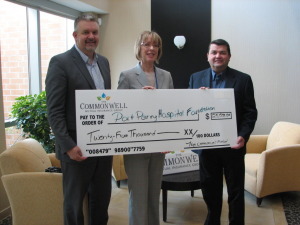 Port Perry Hospital Foundation also recently received a cheque from The Commonwell. The Foundation’s Executive Director, Cindy Lister is seen here (centre) with The Commonwell’s Tim Shauf, President and CEO, and Scott Crone, VP of Regional Development. 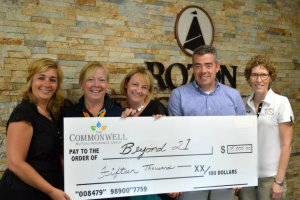 The Commonwell gifted a cheque to Beyond 21. 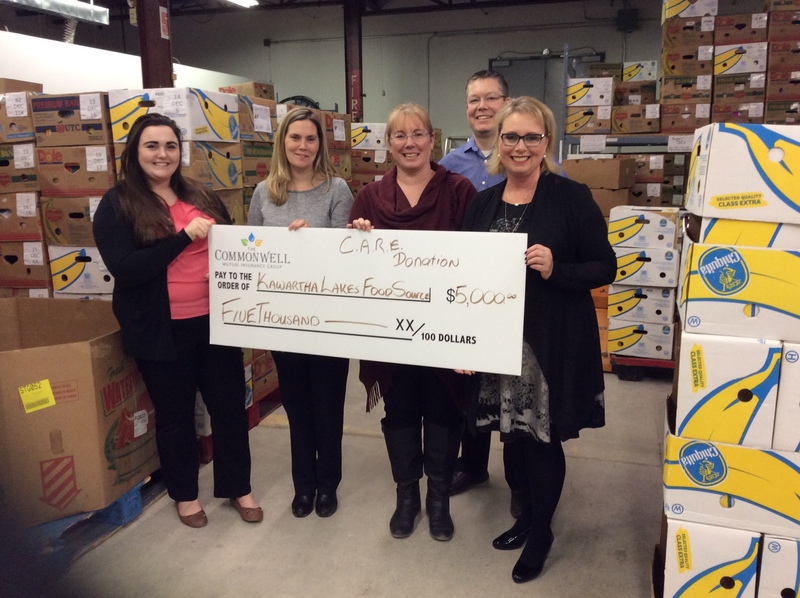 Pictured from left to right are: Rachelle Joanette of The Commonwell, Tish Humphries of Beyond 21, The Commonwell’s Carmel Greene, Todd Rozon (President of Rozon) and Jane McLaren, also of Beyond 21.